August 19, 2015Umuahia, Southeast Nigeria –Five years after he initiated a conference for the revival of Ibo language films, frontline Filmmaker and Activist Madu C Chikwendu has finally redeemed his pledge to the Ibo nation. 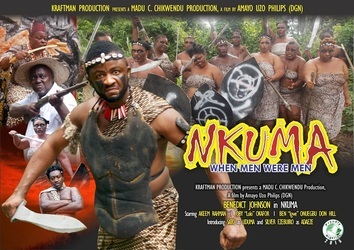 His shingle Kraftman Production has completed Principal Photography on the highly anticipated Ibo Language film “Nkuma“. Filmed on High Definition in the highlands of Abia state, Nkuma goes behind the myth to unearth the realities of being a warrior amongst the Abiriba people of Abia state .Starring Benedict Johnson, Akeem Rahman, Ben Onuegbu and Hajiya Abubakar the movie assembles a glittering cast whose mastery of Ibo language and culture will surely propel the language and culture of the Ibo’s to new heights. The Abiriba, Ada, Abam Ohafioa peoples ofAbia State alongside the Ashanti of Ghana and the ancient Romans are amongst the world’s earliest professional soldiers. They were soldiers for hire used mainly by the Aro’s for slave raiding operations. But amongst these tribes a precondition for fullmanhood isthe provision of a specified number of humanheads. This was the ultimate test of Manhood. Some of the warriors never return from this mission.Okwute’s(Benedict Johnson) father never returnedfrom hismission. Now he must embark on a similar mission and raid a distant clan. Making this movie has always been one of my ambitions in life. Growing up in South Eastern Nigeria it is still difficult to say whether “Ndi Ogbuisi “ ( Head Hunters ) were heroes or villains but they were a bit like bogey men used to scare children…..they were supposedly lurking somewhere in the Bamboo thicket. As a Filmmaker it was quite interesting to research this phenomenon and unravel why they existed in the first instance. Nkuma is helmed by Amayo Uzor Philip (DGN) starring Benedict Johnson, AkeemRahman, BenOnuegbuand HajiyaAbubaker aka Dambaru.Movie is helmed by fast rising DOP Chukwudi Madu with Phil Collins and Fred Amakom as Line Producer and Associate Producer respectively. First Madu and I have been very concerned since the revelation that the Igbo language is dying. So for me it was also a mission…to save the language of my people. So we had to be careful to cast people with the necessary mastery of the language plus the physique hence the choice of BJ (Benedict Johnson as the warrior Okwute. Founded by Filmmaker Madu C.Chikwendu Kraftman Production is the Lifestyle, Audio Visual distribution and Production powerhouse of Madu’s MCM group ( www.mcmng.org.) Other units include Thud Worldwide Consultants Ltd and Lagos Film Institute.Notable brands include Miss Safety International Beauty Pageant, Lagos International Film Festival, and Leap International Film Festival.